Gallup just released the results of a new survey on where Americans get the their news. Not much about the findings are particularly earth-shattering, however, a couple of points reveal something notable about the Fox News audience. Gallup reports that 55% of respondents cite television as their main source for news. As usual, the breakdown of that data reveals that a fair chunk of the viewers selected Fox News as their go-to network (8%), with the remainder of the legitimate news networks dividing the majority of the audience who are not blinded by the right. In fact, more than twice as many respondents chose sources other than Fox. Somehow, these results have produced a flurry of stories proclaiming that Fox is the most popular news network. The shallowness of that conclusion is typical of media analysts who can’t see past a simple list of possible responses. The method Gallup used for their inquiry was to ask an open-ended question that leaves it up to the respondent to choose how much specificity to apply. The answer with by far the most mentions was simply the generic “Television,” which received 26%, and is more than three times the mentions of Fox. The only thing that this tells us about Fox is that their viewers are more cultishly attached to the network and will recite its name upon command. The most revealing part of the Gallup survey was the question that broke down the responses by political views. In this category, Fox News registered some astronomically high numbers for bias. Fully 94% of respondents identified as Republican or leaning Republican said that Fox News is their main source for news. Conservatives chimed in at 79%. 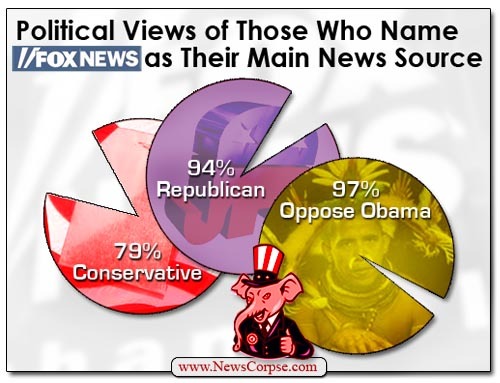 And a whopping 97% of those who do not approve of President Obama pledged their allegiance to Fox. None of the respondents on the left came within 30 points of that level of extreme partisanship. Surely Fox is aware of the character profile of their audience. And just as surely, their editors react to such market research by tailoring their programming to viewer preferences. Consequently, it should surprise no one that a network where more than 90% of its audience are conservative Republicans who hate President Obama spins every story in favor of the right and virulently against Democrats or anything remotely liberal. At this point, anyone denying the reality of this is desperately in need of intensive therapy and high doses of medication. Yet another predictable post. I must say, you are beginning to sound like a broken 8-track. It would be interesting for him to write exactly what he wants to do about this slight against liberalism. maybe he has a good idea in there. He points it out over and over and over again while never actually reaching an audience that would have an impact on those numbers. So far, the ideas seem to center around accepting liberalism/progressivism as your religion and Obama as your messiah and if you don’t – you’re an idiot or a racist or some other type of rotten human being. He’ll deny it, but that pretty much summarizes his beliefs. And the right does not treat Reagan, and Rush as messiah? You two dimwits can’t see your own bias to save your lives. You want to talk about broken record? What about all these made up and exaggerated so-called conspiracies by Obama perpetrated by the Nazi propaganda machine called Fox “News” and sucked up by every closet KKK backwoods, bible thumping mouth breathing retard. Your hypocrisy is more offensive than your foul body odor. And there we have yet another typical left-wing response, containing nothing but insults, name-calling, and a complete lack of substance. It seems you guys like to dish it out but can’t take it? Actually – didn’t you just prove my point with last 3 lines of your response. Using the phrase “the remainder of the legitimate news networks” falsely implies that Fox is a legitimate news network. On June 28, 2013, the Fox News Channel officially became part of 21st Century Fox, a new company that was split off from News Corporation. 21st Century Fox comprises all of Rupert Murdoch’s entertainment entities, such as Fox Broadcasting, the former 20th Century Fox, cable channel FX, and other entertainment companies and holdings. All of Murdoch’s “legitimate” news outlets are now grouped under a second company, which assumed the News Corporation name when the split occurred. Fox News has long been considered an entertainment channel by most of the legitimate news outlets and a large segment of the general population. But Murdoch’s decision to group Fox News with the rest of his entertainment companies under 21st Century Fox is a tacit admission that Fox News was never meant to be an actual news channel and has always functioned as both an entertainment venue and a propaganda outlet that targets a certain subset of the viewing public. It is both disrespectful to all legitimate news networks and insulting to news consumers to imply that Fox News is a legitimate news network. Actually, when I wrote “the remainder of the legitimate news networks,” my intention was to make a distinction between Fox and the rest. Sorry for the confusion. I agree with everything you said. Then you just proclaimed to everybody once again how divorced from reality you are – because what Brazil just typed onto this site is bovine excrement, pure and simple. Now where did I read this? It is so easy to prove that sentence wrong. Remember when the Obama administration tried to block all Fox News reporters out of the White House briefings? The reporters from the other news outlets took a stand and said no way, that is not going to happen. So they stood up for FNC. Fox News is absolutely a legitimate news source. Period. End of story. No amount of fantasizing otherwise will change this fact. There is a portion of programming on Fox that is ‘News’ and could be considered legitimate. There are also portions of Fox that are geared towards dissemination of the conservative idealism. I recall that a minor upsell arose when a 1st row chair in the WH Briefing room came available. Fox wanted it and felt that even though they had been called out for outright lies in reporting White House and or Presidential news, they deserved it. Their attempt was thwarted by a groundswell of real people opposed to the obvious hypocrisy that is Fox News. They lost and it was not because of Obama, it was their own fault. Ask yourself how many friends do you keep close to you even though they constantly tell lies and try to get others mad at you? Sounds ridicules doesn’t it? Fox News prime time line up is not news it consist of right wing opinion commentary shows about news or current events 1.Bill O’Reilly 2. Hannity 3. Greta Van Susteren soon to be replaced by Megyn Kelly.Fox and Friends and The Five I have no words I never make it past 30 seconds in those shows One thing you can count on with Fox all blame will be placed on Obama never let facts get in the way. Egypt oust their president Obama fault. The wild fires in the southwest Obama fault. The Zimmerman trial Obama fault. High unemployment you know who to blame.It’s one thing to be biased but to never be critical of republicans,conservatives or tea-party wingnuts that makes Fox a propaganda machine. Your last line is correct, but it could easily apply to any number of liberal outlets – including this one here – Newscorpse.